Have you ever said something and instantly wished you could grab those words and put them right back in your mouth as if they were never said? If I had only known the power that words held sooner in life, there would be fewer regrets. 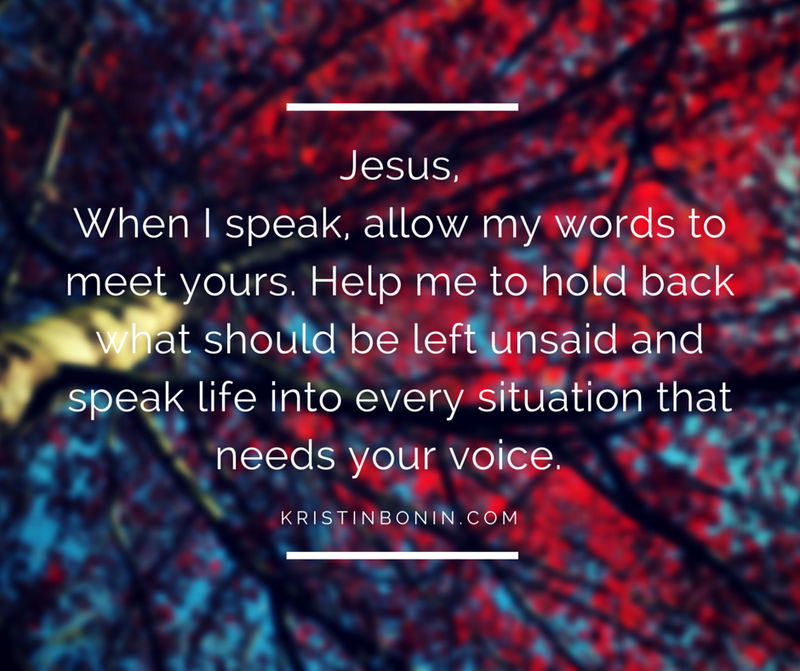 There are many things I would've left unsaid and even more things I would’ve spoken boldly, without fear or shame. Words are so precious. They can inspire, challenge, encourage, affirm and bring hope. In fact, it’s the words that God speaks to us that make us who we are. The Bible instructs us to cling to His words (Phil. 2:16). Words can shape us and mold us into being who God created us to be. Words can also stop us dead in our tracks. They can dishonor the character that God is trying to instill in us. They can corrode our heart and steal our joy. The words we choose can bring disappointment and discouragement in full force to our own soul and the lives of others. With a single word, we can build or shatter. I don’t know about you, but I don’t ever want anything with the word “shatter” attached to my name. Ever. Let’s take a careful look at 2 Timothy 2:16, keeping in mind that the book of 2 Timothy was written by Paul, to a church leader. So, although these words are for all, they are crucial for church leaders. “Avoid Godless chatter because those who indulge in it will become more and more ungodly.” (2 Timothy 2:16). Godless words lead to godless assumptions. Godless assumptions lead to godless opinions and godless opinions lead to godless actions. And no one wins. 1.Are the words I’m speaking offering life or limiting it?Our job is to speak truth, not offer our opinions to and about others. A question we can ask is, “How do you see this, Lord?” It will help us to realign our perspective with His and enable us to be life-givers. 2. Am I guarding my ego or am I guarding another’s heart?We can’t do both. Pride must be laid on the altar of sacrifice when it comes to guarding the hearts of others. We can speak out of pride or humility, but they are not the same voice. The goal is the go into every conversation with the intent to win the hearts of others, not the argument. 3. What do the words I’m speaking say about me? Have you ever heard the old saying, “what Sally says about Susie says more of Sally than it does Susie?” It’s true. It’s wise to do a word check from time to time. What am I saying? Why am I saying it? Where is it coming from? Discontent? Insecurity? Fear? All words have a source. Trace them back and find it. 4. How will these words affect their heart? We EARN the right to speak into the lives of others. The less we speak out of emotion, the more opportunity to have to speak out of wisdom. The things you speak can set the world free. “There is a time for everything…a time to be silent and a time to speak” (Ecclesiastes 3:1). 5. Do I want to be right or godly? Sure, we can listen with the intent to respond or we can listen with the intent to…hear. Set aside the notion that you need to win the argument or solve the problem. There are times when “no words” are the best option. When we’re quiet, God can speak. Let's make our words count. Choose them wisely. Hand-pick them. Craft them. Ask the Holy Spirit to breathe on them so that they are powerful and effective. And remember, if you don't hold your tongue, your opinion won't hold much weight. May our words be chalked full of His.